The Daily life of a Secret Agent: Connecting the Dots to a World War? Recently, the Iranian chief of staff announced that if Turkey places Patriot missile batteries in its territories, a new world war will break out soon. What did he mean? How could a missile defense system in Turkey lead to this global event? 3. Jordanian troops are massing around the Jordan/Syria border preparing for an attack should Assad use any chemical weapons. Remember there are hundreds of thousands of Syrian refugees in Jordan that crossed the border as a results of the fighting. the US will count on the Jordanians and Turkish to do their dirty work if needed. 5. Russia has provided Syria with cruise missiles lately and the Iranian forces have been training the Syrian forces on how to use them. 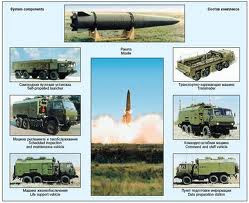 These Iskander missile system, you can see below, is a very accurate half a ton cruise missile that is currently pointed at Turkey, Israel and Jordan an these countries have no real defense against this accurate missile. If the Syrian regime chooses to use either the chemical weapons in his possession or move them more broadly to the Hezbollah or shoot one of his Iskander cruise missiles on any of the countries mentioned above, the good possibility of a wider global conflict is really apparent.